Home / What is Champions on Track? 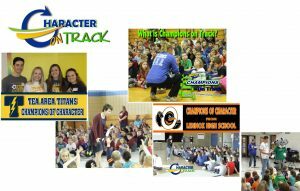 Character on Track is a non-profit organization that exists to provide a character education framework for youth in our schools and communities in Southeast South Dakota and Northwest Iowa based on Five Marks of Character: Trustworthiness, Respect, Accountability, Citizenship and Kindness. We are able to provide our program to over 80,000 students in fifty eight school districts serving 153 elementary and middle schools. Our program, “Champions of Character” is a regional student program designed to help cultivate a positive mentor-ship to our community schools. Senior mentors are selected by the local administration to represent their respective high schools. We work with them to help us bring a positive message to their elementary and middle school students. Their message to the students emphasizes the importance of showing kindness towards others, helping students to apply values like respect, generosity, compassion gratitude and resilience in their interactions within the community, and being a good example for others to follow. The high school seniors are featured on a “Champions of Character” poster that will be distributed to the local elementary and middle schools as we do assemblies and classroom presentations. The 2018-19 Champions are now being selected and we look forward to working with a great group of seniors again this year! Check back with us as we will be announcing the 2018-19 Champions of Character sometime in October! Elementary and middle schools can call us to schedule an assembly or classroom visit now.